these are remakes of skirts i made in 2013.
both are based on the basic A-line skirt pattern from the book “the essential A-line”. 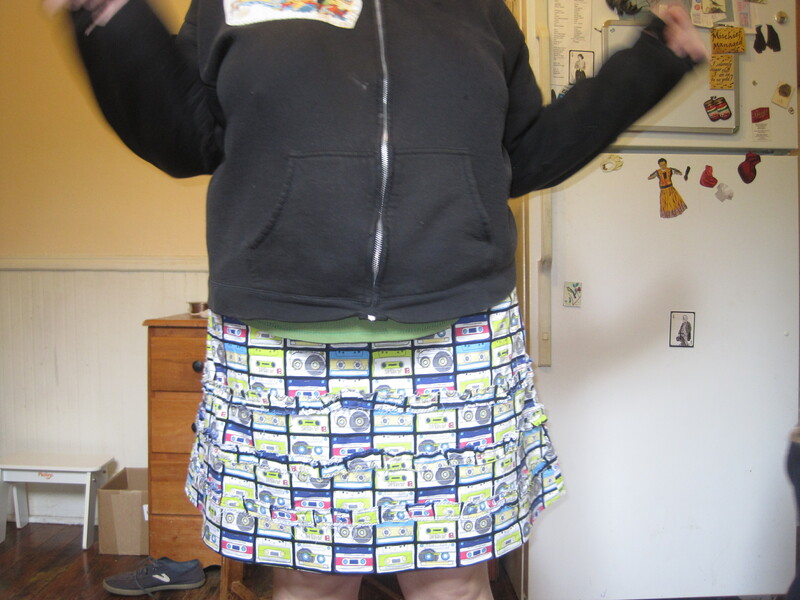 so, the first time i tried to make the mix tape skirt, it turned out fine, construction-wise. but somehow it was way, way, way too big. i cut it out using the same pattern pieces i had used to make several other skirts that fit just fine, so i have no idea where i went wrong. 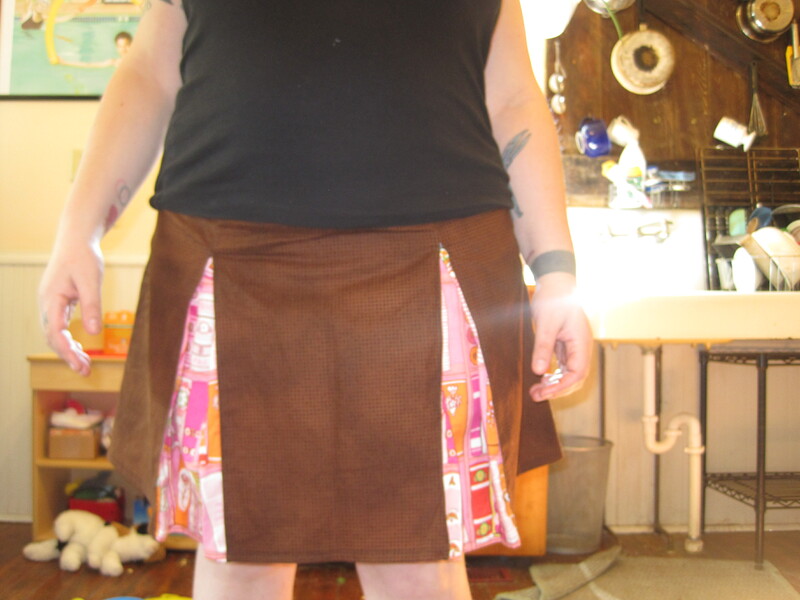 & since i’d made the skirt so many times before, i didn’t try it on to check the fit until it was completely finished. because i didn’t think i would have to check the fit! there was no reason for it to be literally like six inches too big! i wore it a few times with the waist cinched with a safety pin, but come on. i don’t sew so i can hold my clothing up with safety pins. the skirt has a side zip, so i tried to do an easy fix to make it smaller by just chopping a few inches off the other side seam. unfortunately, i cut at the wrong angle & took the A-line shape out of that side. & i couldn’t fix it without cutting the waist too small. 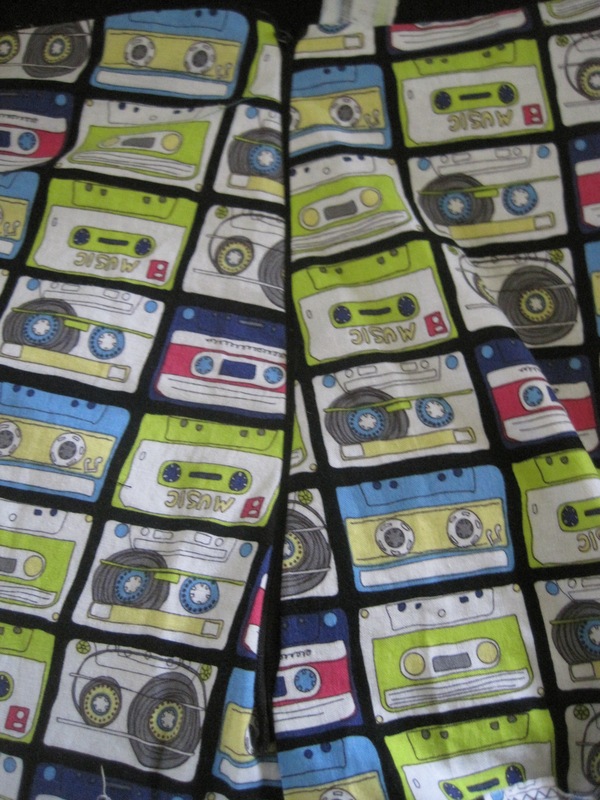 luckily, i had enough of the mix tape fabric to just cut out a new skirt. not so luckily, i spaced out while cutting it & the print is upside down. it’s a busy enough print that it’s (maybe?) not super-obvious, but clearly this is far from my best work. look at the zipper tails sticking out! ugh! making the ruffles means finishing the edges with a zigzag stitch (i mean, there are other ways to make a ruffle, but this is how the book does it) & i had been dreading that part because it’s tedious to sew yards & yards of zigzag. i futzed with my settings a little & probably ultimately used a zigzag that is a little too wide, but…again, whatever. it’s not like i was trying to make a couture skirt. also, i stitched them on in a slightly wobbly fashion. *sigh* if i was making the skirt today, i would have made some effort to line up the rows of mix tapes across the seam so i would have a better guide for where to sew the ruffles. & i would sew a better zipper. & i would make ruffles by folding over a wider piece of fabric & running an enclosed seam up the back, & then ruffling that so i wouldn’t have to “finish” the edges with a zigzag. but hey. life moves on. the problem with the original pleated skirt i made is that i simply could not understand the directions in the book as far as edgestitching the pleats. i did it wrong ten million times, to the point that my pleat edges were getting all frayed & discolored from having been picked out so many times. i finally just cut new fabric to reconstruct the entire thing, & those pieces disappeared into the works-in-progress box for a year & a half. when i pulled them out last week, i was really surprised at how quickly the skirt came together. i used to have to consult the book on how to sew a dart, & i could count on having to rip out the zipper & re-sew it at least five times. not only do i pretty much have the basics down now, but i’m also just a lot faster & more precise with my stitching. i did still have a small struggle with edgestitching the pleats (which is crucial to get them to lay properly), so they are not perfect, but they are worlds better than my original attempt. & now i’m all caught up on old works-in-progress! so nice to get those taken care of, even if it remains to be seen how often they get worn. i spent almost the entire weekend at my cutting table, cutting out new projects. i had quite a few things for which i had all the elements: fabric, interfacing, matching thread, special elastics, zippers, pattern pieces cut out & ready to roll, etc, but the fabrics hadn’t been cut. because that is far & away my least favorite part of sewing. but i just devoted myself to it this weekend, packed each project into a gallon bag with all its attendant notions, threads, & tools, & now everything is all ready to be sewn! i hate wasting time with cutting during ramona’s naps (my only real downtime), so now i can just dive into sewing. i have a purse, a dress, a shirt, a bra, & a few other small projects all set to be sewn. & this is NOT my downtime & ramona has decided that it is crucial that i lavish her with attention right now, so away i go. It’s pretty amazing to see how far you’ve come in a year! I’ve been sewing for something like 10-15 years, and I couldn’t make half the stuff you’ve been making lately. oh, i’m sure you could if you tried. it’s just a matter of following directions. i am really pleased at how much my sewing has improved in the last year or two, & am excited to see where it goes next!